I’ve really been captured by the idea of a “4 in 24” since we started featuring them here on Mortal Muses. I find this glimpse into someone’s life via four shots taken during one day to be really intriguing. I definitely plan to do one of a “normal” day, much like this one that offers a glimpse into Meghan’s day to day life. This time, however, I’m going to share four shots from the very opposite of my normal day. 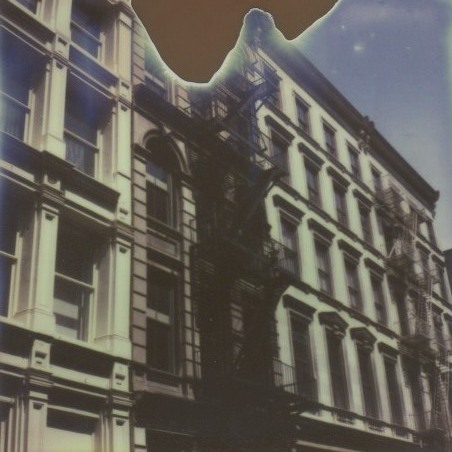 I was fortunate enough to spend a long weekend in New York a few weeks ago and what follows are images that I captured with my SLR680 on Impossible Project film on the only non-rainy day of the three! In fact, because it poured for most of the weekend these are the only film shots I ended up taking, which makes them all the more special to me. I rented a loft apartment in Brooklyn for the weekend so I made my way into the City via the East River Ferry. I loved having the opportunity to sit up top and take in the gorgeous Manhatten skyline view. I’m absolutely smitten with the Chrysler Building. It pulls my focus every time. 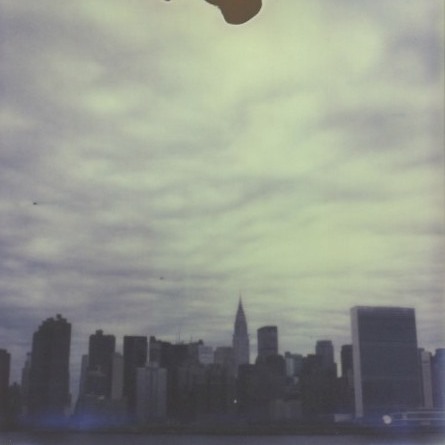 This photo is from my first ride over from Greenpoint, Brooklyn to Midtown. I shot this when the boat was docked at Long Island City (and I’m giving myself major points for getting a straight horizon while standing on a very rocky boat!). Upon arriving in Midtown I made my way directly over to the High Line. While I had planned to spend much of my weekend exploring around Brooklyn the High Line was one of my “must sees”. I’m glad I got over there on the non-rainy day! The beauty of the High Line is that it offers a unique view of New York City. 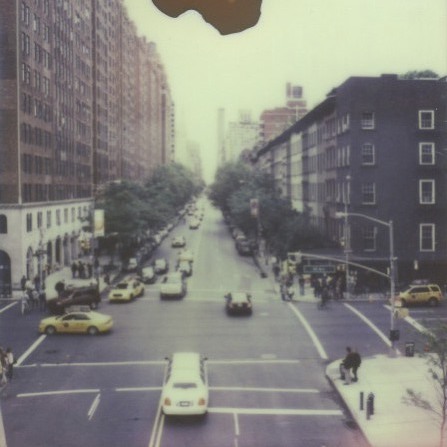 The elevated vantage point allowed me to capture this street scene (yellow taxi cabs!). In addition to the gardens planted along the High Line there are also art installations and plenty to see. I shot this mural with all three cameras that I had with me, waiting patiently for my turn at the best viewing point on the railing. I ended the afternoon in Soho, just in time for the sun to peek out a little. I love the architecture in Soho. My iPhone is full of shots very similar to this one but, as always my favourite capture is the one on film. dozens of tips and tricks from the pros for taking better photos with your mobile-phone camera 60+ photography app reviews for iPhone and Android, so you know which are worth your time and money dozens of project ideas for getting photos off your device and into your world interaction with 32 experienced iPhoneographers and Androidographers, and hundreds of fellow students in a private classroom and on Instagram giveaways, contests, discounts, bonus downloads, and fun fun fun! You can read the rest of the description here. Oh, I miss NYC! Thanks for reminding me of its beauty! Lovely images! Reminds me of the L in Chicago. I love the vintage feel to your photos. Thank you for sharing a peek into your day! I love the 4 in 24 concept. I like the idea of doing it on a “run of the mill” day (but it’s always nice to capture those little getaways too). The shots are wonderful! love the feel of these. glad you had a nice trip. Love the captures of your day. So glad you got some sunshine too! 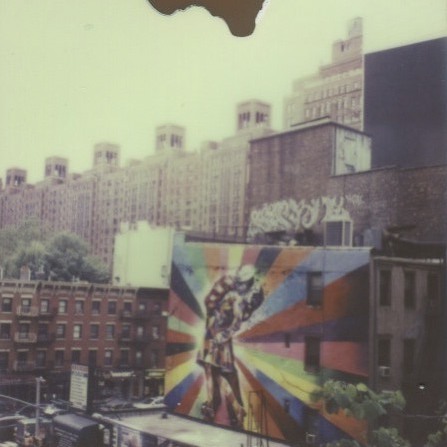 These pictures make me miss New York even more than usual. I wonder the fact they were Polaroids added to the wanderlust. So beautiful!!! I’m with Kirstin, I really miss New York even more!! !